According to all the numbers it looks like Golf is really booming in Finland. Many exhibitors broke their personal sales record this year. 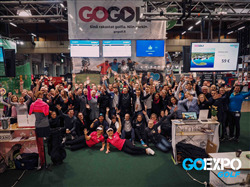 More than 44 000 people visited GoExpo this year. Last year the amount was 36 000. Golf Area was the busiest area of the Expo. There was more than 120 exhibitors in the Golf Area this year which is remarkably more than years before. The Golf area (floor space) also grew by 20 % from last year. In next year’s event (28 Feb - 1 Mar 2020) the Golf area is going to be even bigger than this year. 85 % of this year’s space have been sold already. The cost of m2 starts from €67. The producer Joonas Salonaho is happy with this year results and the co-operation with Finnish Golf Union.